Properties in Villeneuve-lès-Avignon average 4.6 out of 5 stars. The lodges in Provence - Villa "Garrigue"
Property 34: The lodges in Provence - Villa "Garrigue"
Villa with pool, 10 minutes from Avignon, fully equipped. Property 39: Villa with pool, 10 minutes from Avignon, fully equipped. The lodges in Provence - Villa "Ventoux"
Property 43: The lodges in Provence - Villa "Ventoux"
My husband and I stayed for 9 nights and were really glad of our choice. The apartment (home, actually) was perfect for our long stay and situated in a good location. We walked in to the little village every day, took the bus in to Avignon multiple times, and drove to little towns around the area. We spent quite a few afternoons sitting poolside in the secluded garden and enjoying the tranquility. Our only disappointment was that it was not warm enough to swim in the private pool (and that I was eaten alive by mosquitos). A private parking spot and secluded gated entry was a bonus. Although we only used the downstairs area, it appears to be perfect for two couples (another bed/bath upstairs). We enjoyed all the restaurants nearby and did not cook (just toaster and microwave for quick breakfast or snack) but the kitchen seemed totally loaded for anyone who would want to cook. We did take advantage of the washing machine, which was welcome after a month of traveling. Florence was very nice to deal with and we would highly recommend this property for one or two couples. Thank you Florence! 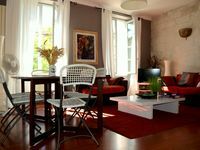 Everything was great about this perfect apartment in Villeneuve les Avignon. Helene was communicative and responsive and greeted us on arrival. The place is immaculate with everything we needed. Full kitchen, comfortable beds and plenty of space. Overlooks a charming courtyard with a few bars and restaurants, with shops accessible by foot. Avignon is a short drive or hefty walk (30 min) and parking is plentiful. We would rent again. Thank you Helene for a great stay.